By the time I turned my head to look, a flock of 30 doves roared over the treeline behind us, dodging and zig-zagging like fighter jets coming in for an attack. The guys to my left let loose on them in a barrage of anti-aircraft fire, but only one dove went down. The rest settled into a field of dead sunflowers and began pecking away. This was 2011, and at the time I’d never seen anything like it, at least not in person. So many doves. The flight looked like those films you see of the legendary Argentina dove hunts, where shooters can kill hundreds of doves in a day and the shooting is so furious you need two guns to prevent them from overheating. So this is what it was all about. This was a bona fide south Texas dove hunt. I was in awe. Dove hunting is a Labor Day tradition in the warm-weather states, and from California to Virginia it marks the customary start to the hunting year. Holly and I hunt mourning doves as much as we can, and we’ve had our good days. But nothing like this. Our doves come in singles and pairs, not huge flocks. As I stood there, sweating in the 106°F heat, so many birds buzzed around me I felt overwhelmed, frozen. The hunt took place in Brownsville, Texas. I was a guest of my friends Jesse Griffiths and Tink Pinkard — both of whom I’d met in Austin when I was there on book tour. Jesse and Tink were, in turn, guests of Miguel Ortiz, a farmer in the area who sells them artichokes and goes by the name of Mikey. Now if you’ve never been to Brownsville, it is a little tough to grasp just how far south it is: The city is at the same latitude as Miami, and the Mexican border is just on the other side of town. It’s so far south it’s tropical. 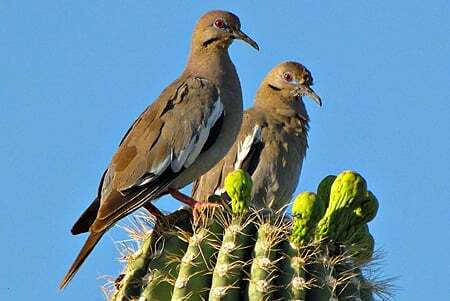 And it is well within the territory of Zenaida asiatica, the white-winged dove. Most hunters never see this dove, which is a bit larger than a mourning dove, but smaller than the non-native Eurasian collared dove. White-wings live only along the southern edge of the US, although they are expanding their range into Kansas I hear. I’d never shot one, and only saw them for the first time when I was in Austin earlier this year. And there were tens of thousands of white-winged doves in Mikey’s sunflower field. They were everywhere, and nearly 100 hunters had gathered at the field’s edge that afternoon to see if they could shoot their limit of 15 birds. Well, actually that’s not correct. They all knew they’d get their limit. It was only a question of how long it would take, and how many shells they would run through to do it. As you might imagine, anyone named Tink isn’t likely to be shy about anything, shooting included. He started blazing away from the get-go, and was soon racking up birds. Jesse and I were in a little more precarious position, because with so many people in the field it was difficult to get a clean shot at a bird without sending hot lead in the direction of one of our fellow hunters. Jesse solved the problem by shooting within a narrow field of fire. As a consequence I’d made a bunch of off-balance shots, missing all but on. Once I had room to shoot, however, I waited for doves to come to me, and only took shots I knew I could make. It worked. Although I finished after Tink and Jesse, I shot my 15-bird limit with only 31 shells, which is by far the best dove shooting I’ve ever done. And I only hamburgered one dove in that whole bunch (it will go into dove stock) — the rest were either wing-shot or had only one pellet in the breast. That doesn’t happen for me very often. After the hunt we all gathered around the barbecue, ate brisket, drank beer and swapped stories of amazing shots, ridiculous misses and of hunts long past. The Ortiz family had laid out a spread for us all, and I couldn’t imagine a better experience for an honest-to-goodness Texas dove hunt. I’ll admit that I was pretty rattled at all those hunters in one field. But no one got shot, and once I figured out the system I had the time of my life. Shooting doves is challenging, as they can fly up to 60 miles per hour and are among the most aerobatic birds in the world. But the shooting was only a piece of the experience. Mikey, his sister Anna and the whole family were wonderful — they felt like old friends even though I had just met them, and even though I was a Yankee from California. I can only hope to return the favor someday, and if I do get that chance, I know just what to serve them. 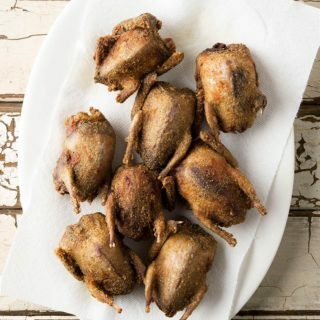 On the long drive home to Austin, I began thinking about how I would cook my doves for Jesse and Tink. Since we were in white-wing country, I thought about a sauce that would speak to that landscape. And here it is. This prickly pear barbecue sauce can be as fiercely hot or as mild as you want. It gets its flavor from prickly pear fruit, tequila and chiles, ideally smoked chiles like chipotle, or wild, hot ones like chile pequin or chiltepin. You can use whatever chile you want. I use whole doves for this, as they pluck so easily. If you don't have whole doves, it will still work but won't be as pretty. 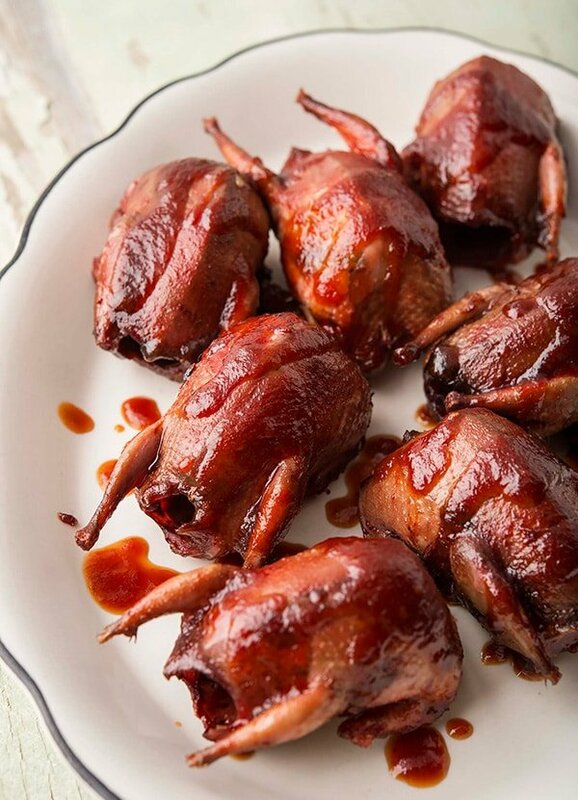 And for you non-hunters out there, use either squab or quail. The sauce can be refrigerated for several weeks beforehand. Coat the doves in olive oil and salt well. Set aside at room temperature while you make the sauce. If you are using fresh prickly pears (also called tunas in Latin shops), remove the spines and chop. My friend Elise has good instructions on how to prepare prickly pears. If you prefer using syrup, you can buy it online or make your own prickly pear syrup. Heat the lard or oil in a medium, heavy pot over medium-high heat and add the grated onion. Cook this, stirring often, until the onion just barely begins to brown. Add the chiltepin or other chiles and then the tequila or mescal, the prickly pear juice, a little salt and the agave syrup, if using. If you are using prickly pear syrup, follow this sequence: Add the chiles, then the tequila and let this boil down by half. Then add the prickly pear syrup and a little salt. Turn the heat to low and let this simmer until the flavors meld, about 15 to 20 minutes. Add lime juice to taste, then buzz the sauce in a blender to puree the onion. Taste the sauce for salt and seasonings, then put it back on the stove and let it cook down to a glaze. Get your grill blazing hot. 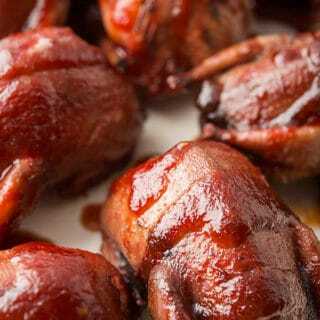 Arrange the doves, breast side up, on the grill and paint the doves with the sauce. Cook for 3 to 5 minutes with the grill lid open. Turn them on their sides and paint them again. Grill for a minute or two, just to get some caramelization on the skin and sauce. Flip and do the same with the other side. Finally, grill the doves on the breast side for 1 minute, just to brown. Take them off the grill, paint them one more time with the sauce and serve. The sauce does require some esoteric ingredients, like prickly pears and chiltepin chiles. You can substitute other hot chiles if you want, and prickly pear syrup is easy to make or you can buy it online -- there is no substitute for it, as it is the backbone of this sauce. 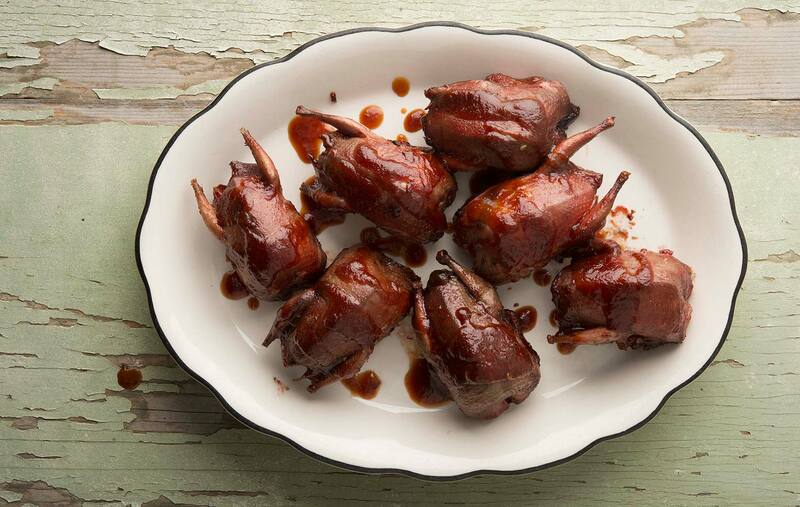 You can find all sorts of recipes for doves and pigeons right here on Hunter Angler Gardener Cook! Rosann: They’re hot. I’d start with 2 or 3, as you can always add more.